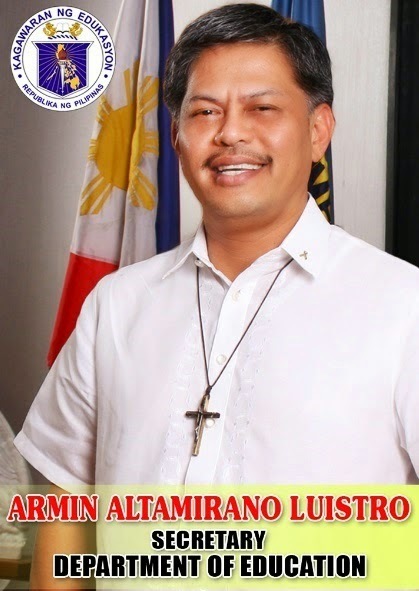 MANILA, Philippines - Department of Education (DepEd) Secretry Armin A. Luistro officially released his message for the graduating students this March 26 and 27, 2015. The message which is available in English and Filipino was published on the official website of DepEd and now available for download. The 2015 Graduation rites is focused on the theme “Saktong Buhay: Sa De-Kalidad na Edukasyon Pinanday” to highlight the importance of education and as a reminder of the stories of our fallen and living heroes, soldiers and teachers alike, who persevered in their education to secure a decent life for their families. "Congratulations to our dear graduates! My appreciation goes out to the teachers, school administrators, staff, and parents who have supported and walked with our graduates to reach this milestone. Today is a testament to your collective efforts—the fruit of your hard work and perseverance. Once again, you have proven that with competence, compassion and a zeal for excellence you can accomplish anything. Dear graduates, as you turn a new leaf towards the achievement of your dreams, bear in mind the values and lessons you have learned throughout your stay in school. Your education has given you the skills to move forward, to pursue your purpose, and to actualize your dreams. Your education continues to cement your foundations to become a better Filipino; one with a keen sense of both self and community, and one who is mindful of diversity that is grounded on acceptance, tolerance, and peace. This year’s graduation theme “Saktong Buhay: Sa De-Kalidad na Edukasyon Pinanday” calls to mind the importance of education as we build the foundations of our dreams. Let this be a reminder of the stories of our fallen and living heroes, soldiers and teachers alike, who persevered in their education to secure a decent life for their families. It impresses upon us the power of education in unlocking doors of opportunities and in enabling us to pave the path to a dignified and productive life, a life that is lived not only for ourselves but also for others. As you forge ahead, you will experience moments of victories and defeats: Let your triumphs be an inspiration for other people; let your losses serve as your motivation to strive for excellence. Let all these collective experiences inspire hope in us to seek greater heights and aspire for a higher purpose. Throughout it all always be mindful of the people who help you along the way and pay it forward to others who will need your help too. For us in the schools, may this theme guide us all as we go forth and realize our mission to provide Filipino learners a quality education that will empower them to attain their life goals.